Super Hero Boy: Looking for something a little diffrent this holiday season? Looking for something a little diffrent this holiday season? I've really started taking account of the things we buy for this household. I've replaced 90% of our paper towel usage with using washable rags, most if not all of our household cleaners are now ecofriendly and a good portion of Connors clothes are now made from renewable sources. Mind you we have a long long way to go before I can truly declare us a green household but I've made it my goal to make a few small changes every month not only in the way we live, but eat, and play. I know man of you would like to start making green choices in your life and have no idea where to start and the holiday season is no exception with so many choices out there its just a bit overwhelming not only to pick products that are exciting but also ecoconcious this includes items that qualify for fair trade. I'm sure some of you are asking what exactly is fair trade? The US has been doing business with developing nations for some time but up till recently very little thought among the consumer mind was given to where exactly do these products come from and are the people who make these products treated fairly? Well the answer to that is not always a good one as sadly in some developing countries workers are treated somewhat like slaves and are paid wages that would make the average Americans jaw drop. Mind you a fair wage to you and to them may be something quite different as the cost of living differs highly as well but regardless a worker should make enough money to feed and take care of his family, I think we should all agree on that one. Needless to say even I am still a bit puzzled as to where to start when it comes to buying items that quality as fair trade friendly though I think I'm getting the hang of organic and green products these days. When I saw Taraluna's shop I was overjoyed as not only does it offer a great tutorial on fair trade but you can find articles on everything from bamboo to building a "no waste lunch". Not to mention Taraluna offers a fabulous selection of fair trade and ecofriendly products that range from baby and toys, cosmetics, clothing, pet supplies and more! You can find a gift for virtually everyone on your wish list and feel good about your choices as well. I know I've mentioned it before but one of our favorite toys around this household is Connor's wooden blocks. After all blocks can be anything you want them to be, castles, houses, I've even caught Connor using one as a car. However things really get fun if you introduce little wooden figures to your block collection as it just brings a whole new dimension to the play possibilities. Not to mention our new recent love of wooden puzzles. Up till a few weeks ago Connor would just rip the pieces out of the puzzles and then that was the end of it but now we are just starting to understand that puzzles fit together. 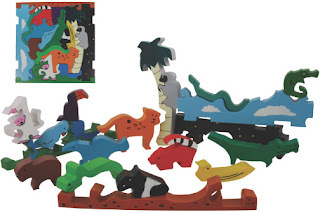 Well his new puzzle that we got from Taraluna, an Imagiplay Puzzle Play Set, does both, its a wooden puzzle which fits together to make sort of a scene but the pieces are individual little animals each a toy all on its own. Actually while your over at Taraluna check out their entire selection of baby and children's products. There is a table and chairs set under the furniture section that I would absolutely love to get my hands on. 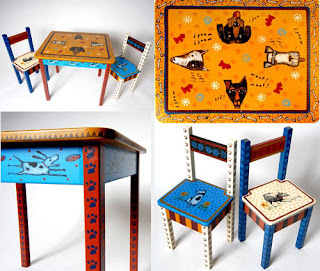 I can actually say without a doubt if I got one of those Crosby and Friends tables I would get rid of my small table in the kitchen and just replace it with that toddler table as its so gorgeous. Head on over to Taraluna to check out their entire collection of gift ideas, while your over there don't forget to check out the learning section so you can learn more about fair trade, organic products, and becoming more "green". In the meantime Taraluna has been amazing enough to give us a $25 gift certificate for one of our lucky readers! Leave a comment on this post. Check out Taraluna and tell me which product other than the ones we mentioned is your favorite!! I like the Word Chase! game. Neat site! the Natural Wood Elephant Puzzle, especially since my one daughter is obsessed with elephants, but they're all great! I would love to try the Mint Mills Crème chocolates. They look delicious. Thanks for the giveaway! My favorite is the Cracked Glass Ornament! I love the Organic Elf Doll Taraluna has. So cute and quirky and whismical! I also adore the wooden Elephant Rattle. My six month old daughter Rowan would love to gnaw on it! I subscribe to your feed via google reader. Thanks! I just love little newborn hats, and the Organic Veggie Hats are adorable! I've got your blog on my Google Reader! I like the ***snowman and santa hand puppets***. My son is really into those right now. But the furniture is great too. Your added to my sidebar. I LOVE the Counting Penguins Puzzle! That's probably what I would buy if I won! Oooh I love Sjaaks chocolates! They are my favorite and TaraLuna sells them for less than what I pay for them in the store! I would love to get the Truffles and some of the bars!! Yum. I would love to have the Heirloom Strawberry plants. Maybe it is because I am hungry but the Organic Fruit Basket & Veggies and Crate look like so much fun! Seriously, if I win I think I'd spend it all on nail polish! I love painting my nails and haven't done it in years because I don't want all the chemicals. The few "safe" ones I've purchased still smell strong and don't work well. I'd love to give their Peace Keeper polish a try because the colors look so yummy! Your button is on my iste. I'm in the tree decorating mode so I was drawn to the ornaments. I really love the camel set made in India. What a great site! Thanks. The Moonstone & Sterling jewelry set is stunning~! Organic Cotton Cardigan & Pants Set -- adorable! I like the To-Go Ware 2-Tier Stainless Steel Food Carrier. I love the Sealife Puzzle Play Set and the Blue Bali Lantern. I love the Glycerin Soap 3 Bar Gift Assortment. Thanks so much for this giveaway! i love the Dog Walkers Bath Set and my boston terrier would love it too. I really love the Organic Veggies and Crate. That is so cute. Thank you! Organic chocolates! The ladies clothing I like too. The chocolates lol and the organic bear.. very cute. My favorites are the Mint Mills Crème chocolates. I love all of their organic dog toys! The kids table and chairs are just too cute. I like the batiked cats! Extra entry-I posted your button on the sidebar of MomReviews under the "Reviews and Giveaways" section. I'd write a post linking back to this but I'm already completely booked with posts, so I twittered it instead, hope that's okay! The Mixed Huipile Pillow Cover is my favorite-it's gorgeous! I love the natural wood puzzles they are so great. Thanks! Love the Blue Bali Lantern! I love the counting octopus wooden puzzle! I love the Organic Knitted Bear Teether/Rattle, it's cute and my baby daughter would love it, thanks so much for such a wonderful giveaway! I am also and email subscriber, thanks again! Their step stools are beautiful! I love the Mandarin Butterfly Double Step Stool - so pretty, thanks! I'm a new reader subscriber, thanks! I really like the Cracked Glass Ornaments! So pretty! The Ornaments of African animals, and the Elephant Mobile, are just treasures to be added to my Christmas tree this year...We have a living room that is decorated with Victoria Falls,Africa inspiration, including photos and dolls of Africa. What exciting finds of "my safari" on your site! I like Complete Healthy Feet Kit with Foot Scrubber. 1- Loving the Hemp Mouse kit! My cat would go nuts! 2- Also, I blogged this contest. The counting Penguin puzzle is great! I love all the organic dog toys. I love the butterfly rhapsody step stool. I like the Counting Bunnies Puzzle. I really like the Crosby's Friends Double Step Stool. So much detail! Thanks. Their Travel Line Robe Set would make a wonderful gift. Thank-you. "A Little Something for The New Mama" sounds great! I like all the Christmas ornaments and mostly the cracked galss ornament. very unusual looking. I love the Organic Lovie Blankie Monkey. i love the "family" puzzles esp the elephant family...i like the large selection of organic and fair trade toys:) thanks! What a great variety of products--I managed to narrow my favorites down to two. I love the Zip Ultra Suede Hobo and the Hand Beaded Heart Shaped Coin Purse. Thank you for the contest! The Sealife puzzle playset would be great! Thanks for the giveaway! I love the Ravenswood Spa Collection! I would like to try the Thai gift bag. I love the Under the Nile Veggies and Crate--in face, we are going to get this for our son for Christmas! i love the Jayden Earth Girl doll and all those clothes are great too! Love the word chase game. I like the Dainty Pearl Drop Earrings! vegan nut & chews look good! I love the Reversible Velvet Patch Hats. They are beautiful. All of their stuff is beautiful. I like the Organic Monkey w/Squeaker 10" for dogs. I would love the Chocolate Truffles Assortment! That Organic Elf Doll is so funky! I love it and so would my little pumpkin of a daughter! I'd love to have the Bohemian Garden Double Step Stool. It's lovely and useful. I think the pet toys are cute especially the Organic Lucy Bunny w/Removable Squeaker - 10"
Ilove the graphic designs hemp bag so cute thanks. My favorite is the Nursing Mama with Baby in Sling doll! I love the organic baby clothes, especially the Organic Infant Gift Set. I would love to try some of their delicious teas like the Ambrosia White Plumb and the Sense of Peace. I would try 'Word Chase', since I am trying to teach one daughter letters and reading now. My sister-in-law would also like this since my nephew is also around the age to start reading. Lots of great things here! I like the Wicker Bicycle Basket. My favorite is the Four-Step Healthy Feet Kit. I like the Bali Blue Lantern! I love the Laptop Lunch Kit! i like the Bohemian Garden Table and 2 Chair Set. My favorite were the Hemp/Wool Blend Earflap Hat & Mittens sets. I love the Lion and Lamb ornament. I LOVE the "Recycled Silk Sari Scarf - Hand-Knit"
The Diamond Shaped Moonstone earrings are gorgeous! Thanks for the chance! My Fav (and what I would buy) is the 'Complete Healthy Feet Kit with Foot Scrubber'. I would luv to splurge on pampering for myself. Great site and great giveaway!! All of the products are so different and great. I love the Wooden Java Box is fabulous. I love the wooden puzzles. I like the 3 tier stainless steel food carrier. I would like an organic elf doll. I love the Word Chase game!